You don’t think any dog can smile … laugh? 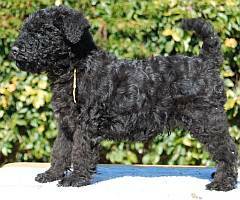 Just watch a Kerry Blue Terrier for a few minutes – he is a born clown. A sense of curiosity? Well, he has one, he wants to know what you are doing every minute – and why. 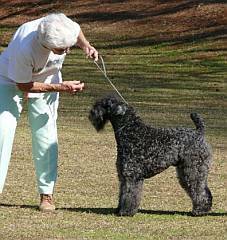 A Kerry being inquisitive is very quick to learn new things and as a result can be involved in any of the animal sports such as breed shows or agility. Kerrys make ideal house pets. They are a perfect size – not too big or too small. About 16 kg and 45 cms tall. They do not shed hair all over the house or your clothes, and have no doggy odour. Once you have owned such a dog you will never want any other breed. The best home is one that is tolerant of a busy dog. 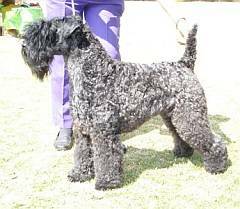 Kerrys are people dogs; they love to be part of a family and have a strong affinity with children. They generally live to 12 years, but 16 is not unheard of. I have bred Kerrys for many years - 33 in fact. All my puppies are raised in my home. I live in Midrand can send to any major airport at the purchaser’s expense. Puppies are KUSA registered, microchipped, inoculated and dewormed. There are no breeding restrictions. Buyers receive a signed KUSA registration certificate.